W hile Cartier has a long history of making both watches and jewelry, they are best known as a high-end French jeweler. 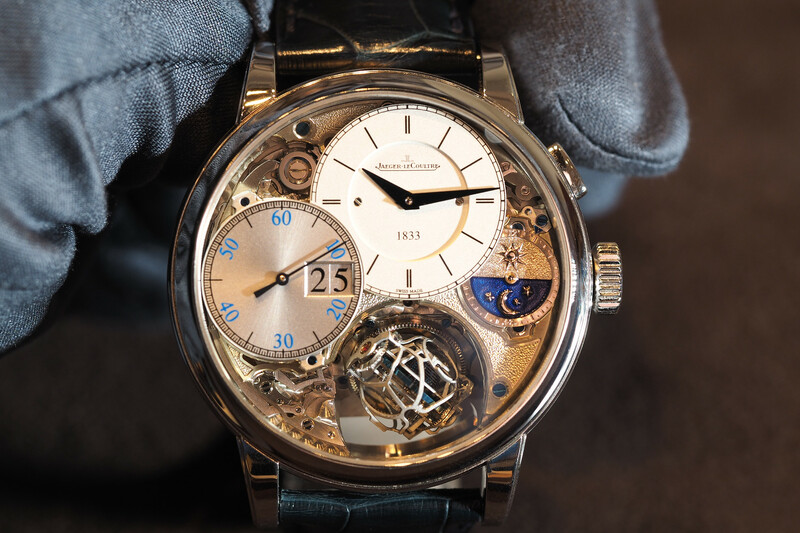 However, in recent years they have significantly increased their watchmaking efforts. 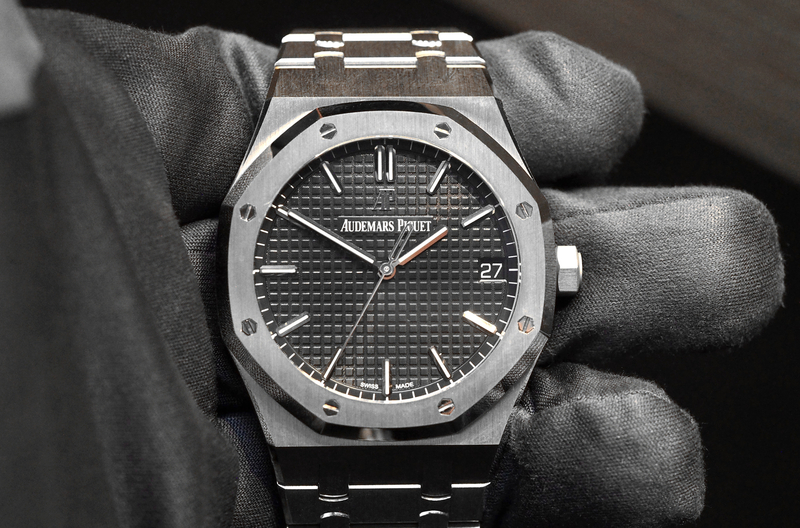 Notably, while they were founded and are still based in Paris, France — they make all of their watches in Switzerland. Many of which are now being fitted with premium manufacture made movements. Unveiled at SIHH in January, the Calibre de Cartier Chronograph, for example, is the newest of the brand’s timepieces to receive a proprietary manufacture designed and produced movement. Cartier’s “Calibre de Cartier” Chronograph comes in 6 variations: steel on steel bracelet, steel on a brown leather strap, steel with gold bezel on brown leather strap, steel with gold bezel on steel bracelet, pink gold on brown leather strap and pink gold on a pink gold bracelet. For this review, we chose the most classic version, the stainless steel on steel bracelet. Crafted in stainless steel, Cartier’s signature round 42 mm case, with alternating brushed and polished surfaces, has a fixed stainless steel bezel that is engraved with a 0-60 second scale. The bezel has a beveled design that matches the two chronograph subdials. The inside of the bezel has a satin type finish, while the outside edge is fully polished, contrasting nicely with the brushed finish of seen on most of the case. Inside the Calibre de Cartier Chronograph is the all-new 1904-CH MC caliber with column-wheel and central vertical clutch. 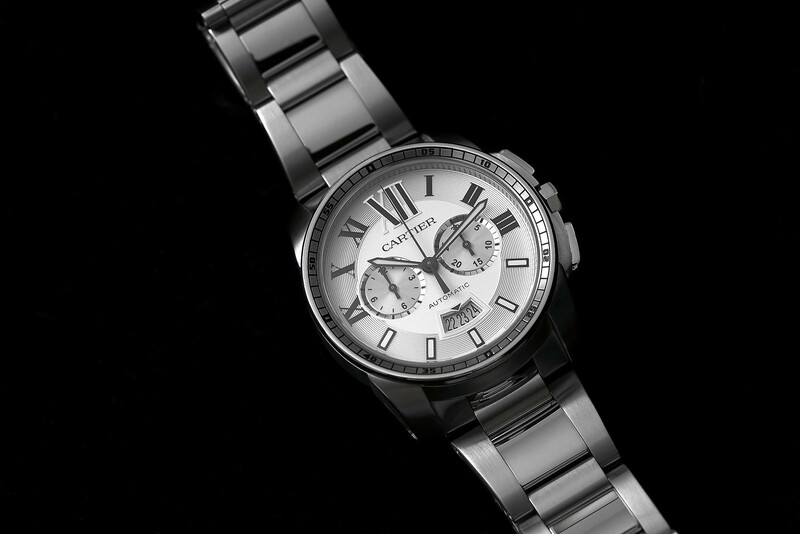 Cartier lists the diameter as 42 mm and the thickness as 12.6 mm. However, we measured it with a precision digital caliper, and while the bezel does measure 42 mm across, we came up with just over 43.5 mm across the diagonal of the case, 47 mm including the crown and approximately 12 mm in thickness. 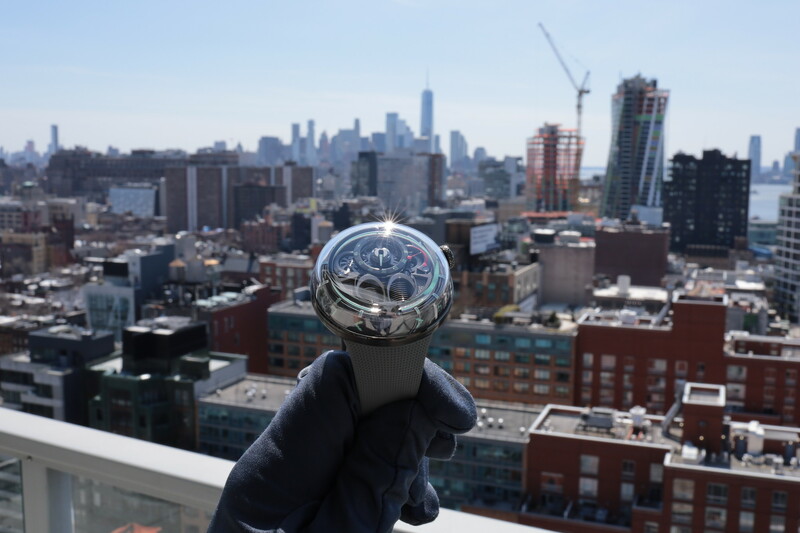 It is hard to accurately describe a watch with just numbers, as shape, overall proportions and fit are far more important than any single measurement; which is why we always suggest trying on any watch before you buy it. Even if you choose to buy online, you should try it on first at the store. A seven-sided crown is set with a synthetic spinal blue cabochon on the steel model; a faceted sapphire on the gold version. The push-in crown is a good size, making it easy to adjust, but without being so big that it digs into your wrist. The actuation of the pushers is nice and crisp. Not as smooth as a Lange pusher, but much better than a 7750, for example. This is likely due to the simple fact that flat pushers are easier to push, and that the chronograph features a more sophisticated central vertical clutch. Inside the Calibre de Cartier Chronograph is the all-new 1904-CH MC caliber with column-wheel and central vertical clutch. It beats at 4Hz, has 269 components, 35 of which are jewels and is equipped with double barrels that provide a maximum power reserve of 48-hours. A sapphire case back allows a view into the finely finished movement which consists of Côtes de Genève (Geneva stripes) on the bridges and oscillating weight, and circular graining on the mainplate. The dial is has a silvered opaline finish (which looks white), part of which is snailed. Hours are marked by Cartier’s signature Roman numerals on the upper half of the dial, with standard indexes on the lower half. The Roman numeral XII (12 o’clock) is stamped, whereas the other six Roman numerals are printed (transferred). The indexes are stamped (applied) and feature a luminous treatment. A cool detail we noticed, only under the magnification of the macro lens we used to shoot the photos or a loupe, is that the X Roman numeral hour marker has the word ‘Cartier’ printed diagonally across it (you can see in the second image – shown above). The large sword-shaped hour and minute hands are in black oxidized steel with a luminescent coating. The central second hand and chronograph counter hands are black with no lume. The dial layout has a bi-compax design, with the chronograph hour counter (at 9 o’clock) and the minute counter (at 3 o’clock). Each subdial has a snailed finish with diamond-set beveled rings. A horizontal panoramic window at 6 o’clock displays the date (versus the Cartier de Calibre time only models which have a vertical panoramic date window). Protecting the dial side is a sapphire crystal that has been glare-proofed and is slightly curved. The caseback is stainless steel with a flat sapphire crystal window secured by 8 screws. Water-resistance is 100 meters. Steel bracelet measures approximately 23 mm at the crown and tapers down to about 20 mm at the clasp. Center links are polished, providing a nice contrast with the rest of the bracelet, which is brushed. Pierced lugs and functional screws make it very easy to install and remove the bracelet with just a screwdriver. The bracelet links are screwed in as well.